Slaughtneil's Brendan Rogers under pressure from Liam Hinphey, Eoghan Farren and Thomas Brady of Kevin Lynch's during the Derry Senior Hurling Championship semi-final at Owenbeg. (Picture Margaret McLaughlin). Champions, Slaughtneil, kept their quest for a third successive Derry Senior Championship title on track but only after Kevin Lynch’s took them to extra time in an exciting encounter at Owenbeg on Saturday. Slaughtneil entered the game as odds-on favourites but Lynch’s did not read the script that cast them as rank outsiders and battled with great tenacity from start to finish. Tactically they set up to ensure Slaughtneil would not plunder goals as they did against Ballinascreen, with Kevin Hinphey outstanding as sweeper and Ciaran O’Kane doing a good marking job on Chrissy McKaigue. Yet they were almost totally reliant on the free-taking skills of Ciaran Herron for scores, the former Antrim star pointing 12 frees and converting a 9th minute penalty that tied the scores at 0-3 to 1-0. However, while not at their fluent best, Slaughtneil were never headed and scored 1-12 from open play, in contrast to Kevin Lynch’s who managed just 0-3. The Emmet’s led 0-7 to 1-3 at half-time and looked to be in control when Brendan Rogers took a pass from Jarlath Mulholland in the 33rd minute and blasted the sliothar to the roof of the net for 1-8 to 1-4. However five frees from Herron narrowed the gap to the minimum in the 58th minute - Kevin Lynch’s claims for a penalty turned down - before Paul Sweeney levelled at 1-10 each, Herron and O’Doherty spurning chances to land a winning point in the final minute. In the first period of extra-time, Slaughtneil took a 1-15 to 1-11 lead, with Chrissy McKaigue Cormac O’Doherty, Sé McGuigan and Gerald Bradley on target. 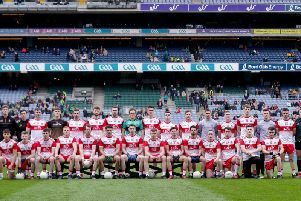 Again Kevin Lynch’s fought back to level but Cormac O’Doherty held his nerve to fire over the winning point in the final minute of a thrilling contest. Referee: Alan Nash (Na Magha).